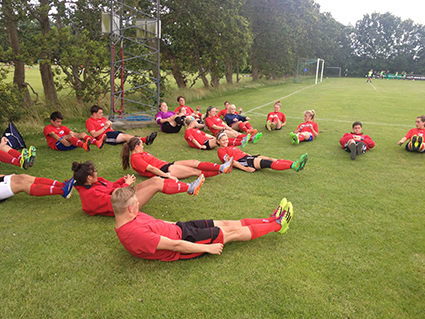 Another good day on tour and our first full day in Denmark. After breakfast, the boys have a friendly game vs a team from East Africa. Lots of fun and we play well and goal from Luciano Brignone and Kendall Taylor secure a 2-1 win. Harrison Vantilburg was stellar in goal once again and boys are finding a groove, just in time. 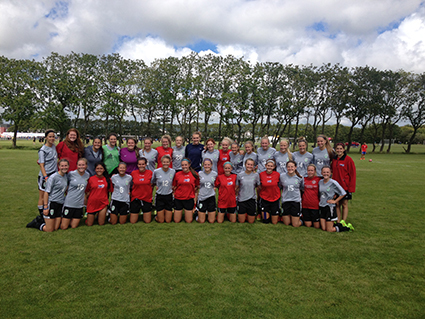 Girls play next vs. a team from Minnesota and we tied 0-0 and for fun went to Pks. Guess what, we made all 5 of our PKs, yes, thats right all 5. Soooooo happy, LOL. Relaxing time in the afternoon, crowded first dinner and then opening ceremonies as we walk through town and end up in the stadium. Different from Gothia cup but fun nonetheless. Kids in bed, well at least the girls are, while the boys are playing soccer tennis in their room. Hard to be upset with them for doing that, of course until they break something, but without phones, I like that they are doing stuff together and with a ball. We have all of the kids on the same room at Dana, Girls in one and boys in the other, including our guest players. The boys have a Swede, Christian, and the girls have a Swede, Wilma, and 4 Danish girls, Emma and Astrid from Odder, Simone, Stina, and Sophia from Hjorring. Great fun with the culture exchanges and all having a blast. Games officially start tomorrow and 7 am breakfast so off to bed.